Learn how to share Dropbox files on Azendoo. What are Azendoo integrations with Dropbox? Azendoo has great integrations for you with Evernote, Box, Dropbox, Google Drive, and OneDrive. By adding your Dropbox account, you can easily share selected contents with only the people who need access to get work done. How to link my Dropbox account to Azendoo. Your Dropbox account is never connected to your Azendoo account. Azendoo uses the current session from your web browser to access and share files. This will log you into Dropbox on your browser, and you will be able to share files on Azendoo. If you have Dropbox for a business account, you can use both your personal and professional accounts logged at the same time. Go here to learn how to connect the two accounts. 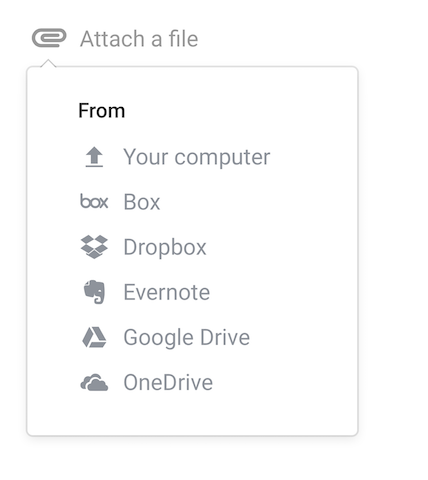 Select Dropbox in the dropdown when clicking on the “Attach a file” button in Azendoo, which will open the Dropbox window. From there, choose the files you want to share and click on the “Choose” blue button. The files will be added on Azendoo in the form of a link. Anyone who clicks on the file in Azendoo will be redirected to the file on the Dropbox online file viewer. How to disconnect/change my Dropbox account. Simply head to dropbox.com and log out of your current session. You can then log in to another account if you want to change the account linked with Azendoo. How to change the language of the Dropbox integration. In order to change the language on the Dropbox window, you need to change the language on your Dropbox account.